Biggest of the three operating units is Arriva Merseyside headed by MD, Howard Farrall operating buses from depots at Bootle (100), Birkenhead (95), Green Lane (121), Speke (128), St Helens (123) and Southport (65). Heading Arriva Manchester is John Rimmer. He is responsible for over 220 buses based at depots in Wythenshawe (68), Bolton (66), Runcorn (47), Winsford/Crewe and Macclesfield which have a combined allocation of 45. Last and by no means least there is Arriva Buses Wales, where Michael Morton is the MD. He overseas depots at Wrexham (37), Chester (36), Bangor (62) and Rhyl (46) along with outstations at Pwllheli, Amlwch on Anglesey and Llandudno. I spent a full day with Philip Stone and Phil Cummins, touring the patch and hearing about some of the many initiatives they are pursuing with the aim of achieving growth. Our tour took in the launch of the new fleet based at Bangor for the 5 and X5 service that was separately covered in issue 1267 on 14 March 2014. We began our tour at Runcorn where we joined General Manager, Sue Madigan. Her all single deck allocation of 47 includes ten of the 21 Caetano bodied MAN gas buses Arriva took delivery of a year ago (the other 11 are at Darlington). 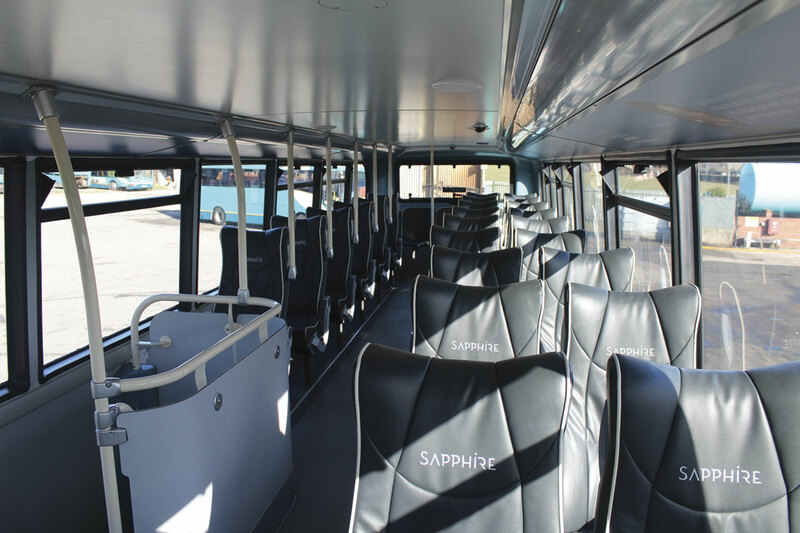 Equipped to a high standard internally with blue e-leather seats, LED lighting, forced air ventilation and free wi-fi, they combine the quality and environmentally friendly attributes to attract passengers. Runcorn benefits from something that was for many years unique in the UK and is still very impressive. The busway opened in the early 1970s, when Runcorn was a new town, and provides six miles of road exclusively for buses. 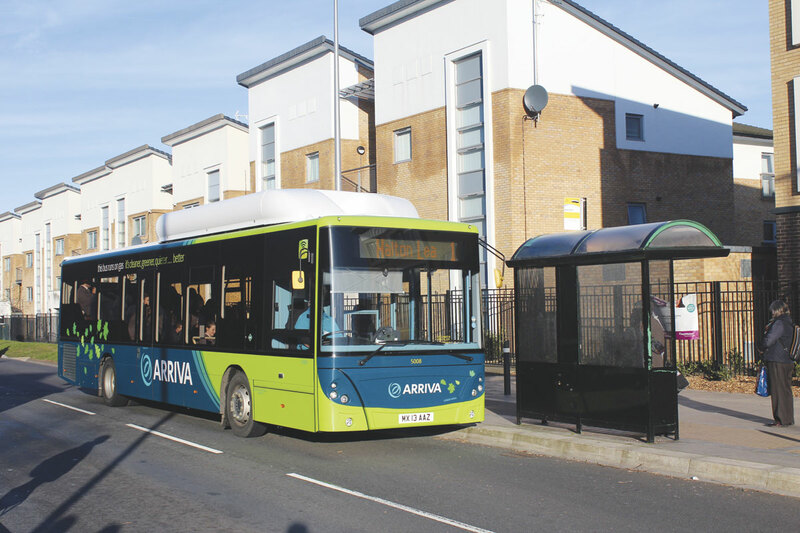 Quite tight in places and with underpasses suitable only for single deckers, it provides a segregated haven for the important 1 and 2 services on which Arriva employs the gas buses as well as services run by Halton and a local independent operator. The clear, calm of the tree lined busway with its integrated bus stations contrasted with the bumper to bumper traffic of my journey in from Widnes immediately beforehand and showed what can be achieved when planners consider public transport needs from the outset. The gas buses themselves are performing well delivering a fuel usage reduction of over 26%. Feedback from passengers about them is also very good. With the ability to use the gas buses to their full potential only just realised, their operation is settling down. The already well patronised 1 and 2 services have yet to show growth but there is a clear improvement in the perception of quality being offered. 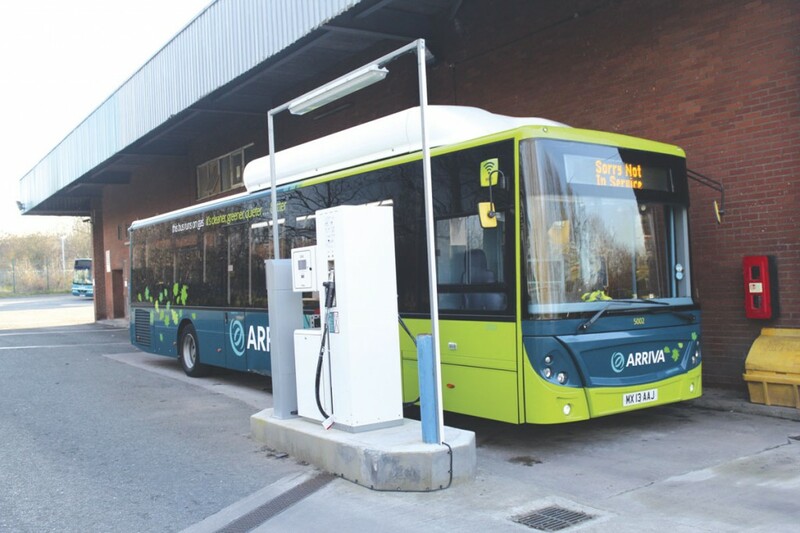 Most of the £500,000 cost of the refuelling facility is being met within the terms of the gas supply contract with the Gas Bus Alliance, though Arriva did have to pay £180,000 towards the civil engineering works required, which included upgrading the gas lines into the site and an electrical substation to power the compressors. There have been issues with setting up the fuelling infrastructure, which had only just been completed two weeks prior to my visit; a year behind schedule. This required the rather expensive solution of refuelling via mobile tankers in the interim, an additional £1,000 a week expense. However, the performance of the vehicles has been such that the two Phils are keen to take a further ten gas fuelled buses to fully utilise the installed capacity. 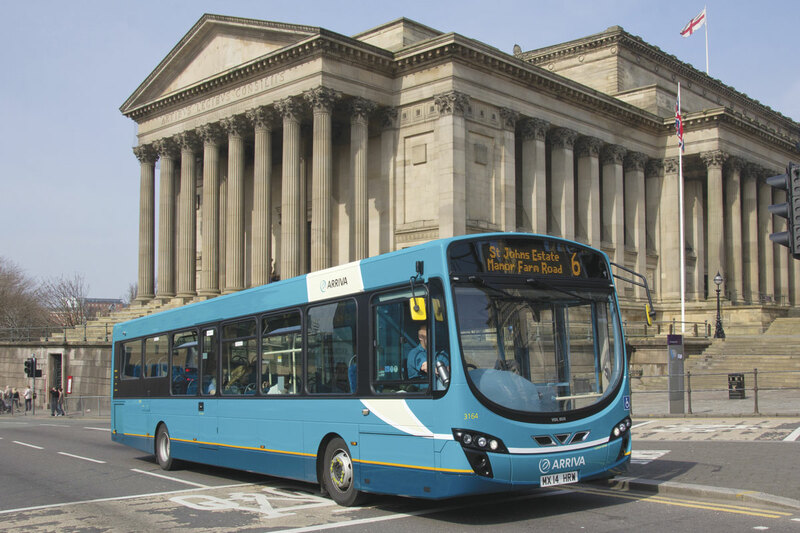 If funding can be obtained the plan would be to use them on the 82A service to Liverpool. The price has come down from the £220,000 each paid for the initial buses, a figure mitigated by support from the Green Bus Fund. Attempts were made to get funding through the Better Bus Areas Fund but these were unsuccessful. Gas bus operation could be extended beyond this but more storage capacity would be required to accomplish it. An early start at Runcorn left us time to call at Wrexham on our way to Bangor, where we were welcomed by recently appointed Engineering Manager, Steve Parry. Wrexham operates service 1 between Wrexham and Chester and in April last year it became the first of Arriva’s new premium Sapphire branded services to launch. 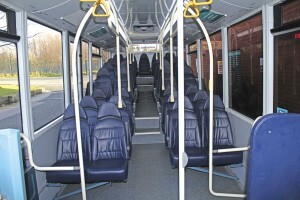 It initially utilised nine ADL Enviro400 double deckers refurbished in the company’s own St Helens facility and repainted by Bus & Coach World in Blackburn. 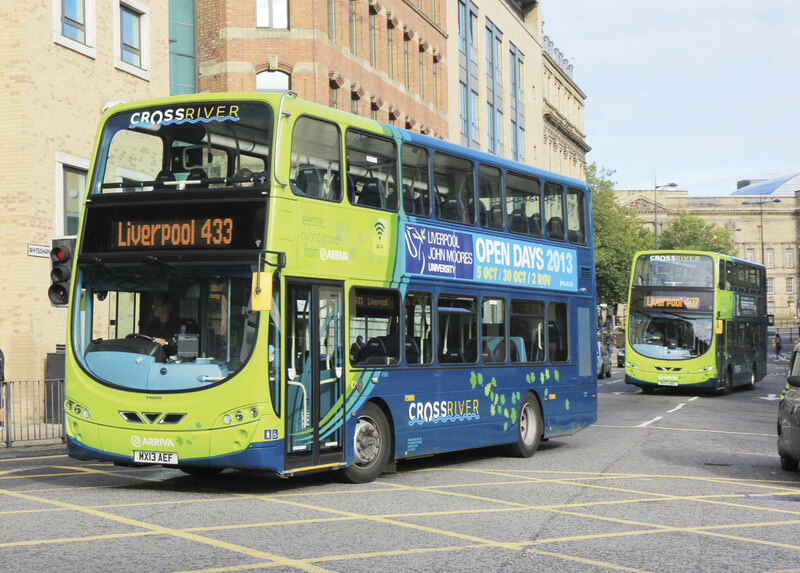 Dating from 2008, the base vehicles had previously seen service on the Cross River services operated from Birkenhead depot, where they were replaced by Volvo B5LH hybrids. In a process that saw around £27,000 spent on materials for each bus, they were very extensively refurbished and equipped with new Esteban Ega fixed coach seats trimmed in e-leather with attractively embroidered headrests featuring the Sapphire brand. Each bus has phone/laptop chargers, free wi-fi, television monitors working on a loop and a dual language next stop passenger announcement system. 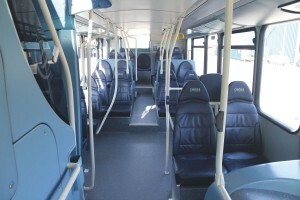 Tip up seats on the lower deck were removed as part of the process of making them more comfortable and spacious while every bus has a different theme focussing on somewhere on the route. 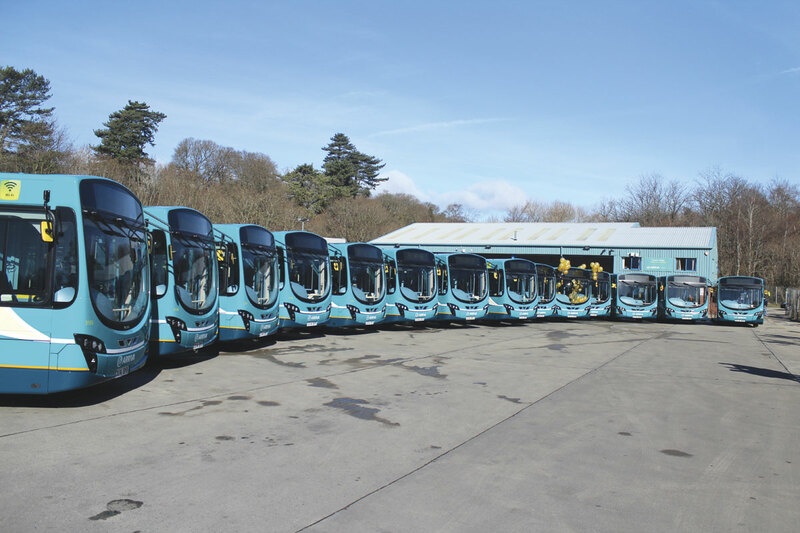 As a final touch, all have been given personalised registrations ending in ABW (Arriva Buses Wales). The combination of the various factors has seen growth from the outset of around 15%. All factors are tracked in detail with the actual growth level varying from week to week between 8% and 21%. Race meetings at Chester help considerably in boosting it. To maintain this trend, another two similar buses to the same specification are being converted at St Helens to take the total fleet to 11 vehicles. Two further Sapphire services are planned for Arriva North West and Wales during the coming year. 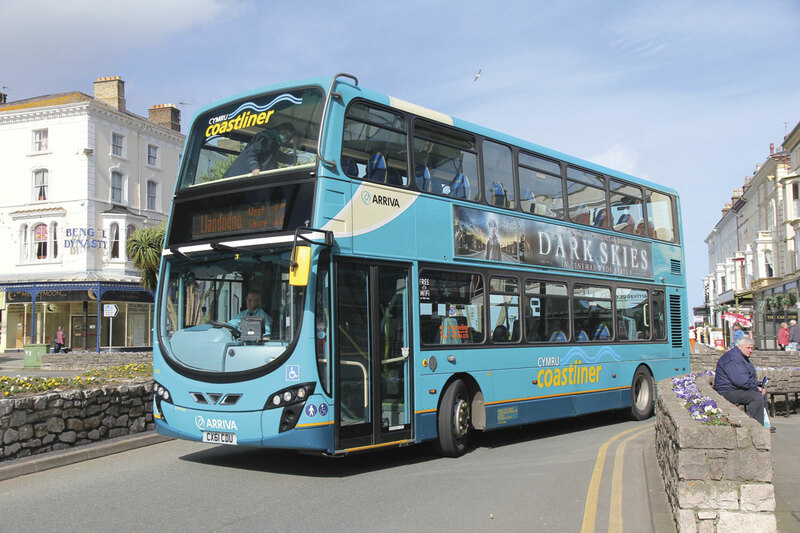 The first scheme will see 20 brand new standard length ADL Enviro400 double deckers introduced at Rhyl for use on the Coastliner 12 service, a route that despite its coastal location is busy all year round. They will replace DB250 double decks and also have 2+1 upper deck seating. Arriva sees new double deckers as an important tool in the promotion of growth. 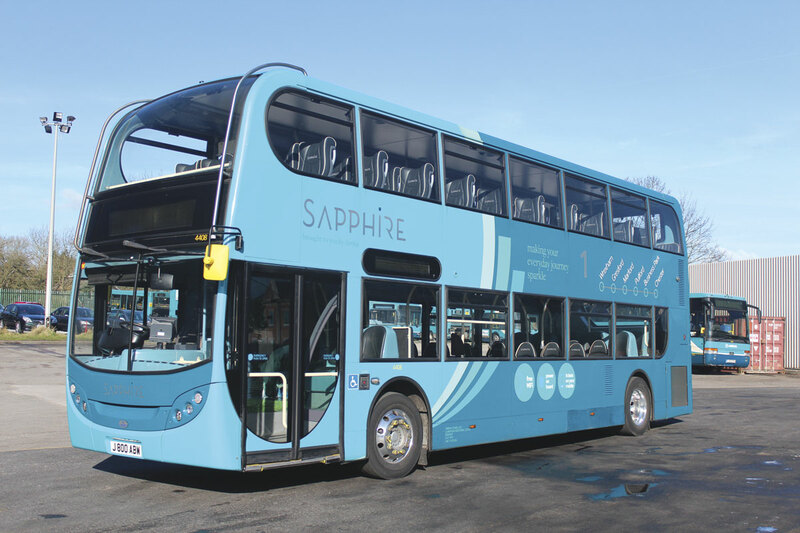 The second new Sapphire route will be in Bolton where the 575/362 services between Bolton, Wigan and Chorley are being upgraded. 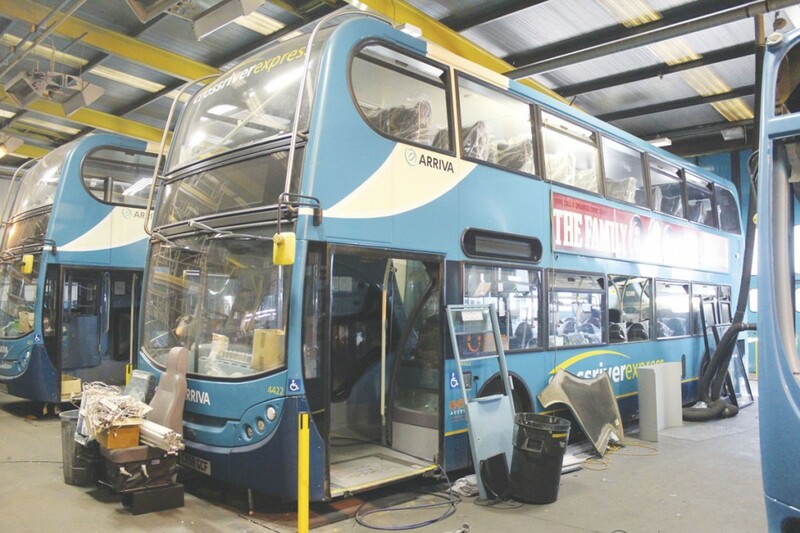 This will retain the existing 58 and 09 plate VDL SB200 Wright Pulsars which will be refurbished to Sapphire specification in the company’s own St Helen’s bodyshop. Part of the philosophy behind Sapphire is to try different approaches in different locations to try and quantify the results that different levels of specification produce. As previously mentioned, a fleet of 15 new 14-plate VDL SB200s with Wright Pulsar bodies have just gone into service at Bangor depot on the 5 and X5 services between Caernarfon and Llandudno. 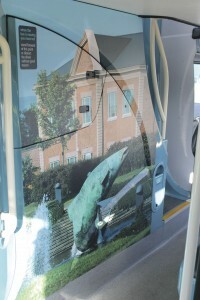 It is claimed that this represents the biggest single new bus investment in North Wales in the deregulated era. 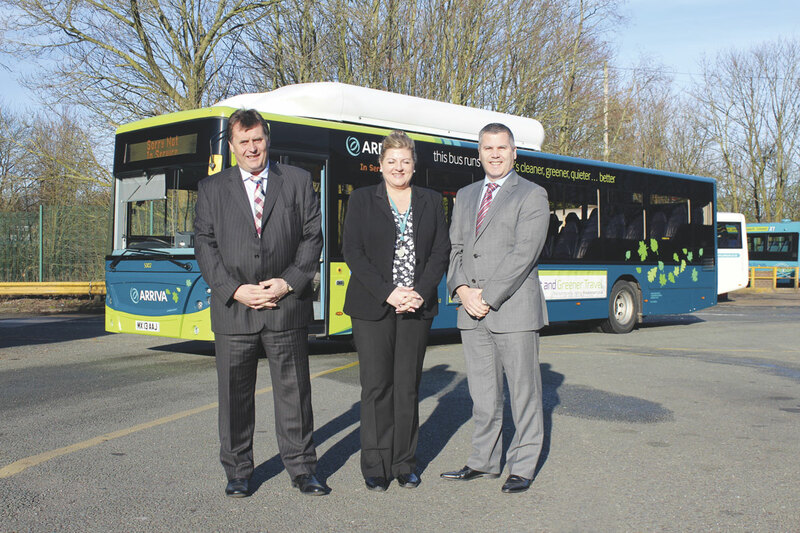 The 5 and X5 have seen sustained growth over the past three years since Bangor took on sole responsibility for the services and it is hoped the new vehicles will continue this positive trend. Further developments in Wales are seeing rebuilding work undertaken at Wrexham depot where freak weather late last year saw two feet of snow fall overnight, proving too much for the depot roof, which collapsed. Demolition of the building was underway though whether the structure will be fully replaced had yet to be decided. The next major building priority is to replace the depot facilities at Rhyl with new ones on the same site, which is very well placed for the town. There are currently issues with the pits flooding at high tide. What he envisages is something similar to the set up at Bangor depot, which was erected around eight years ago. Time restraints meant that we didn’t call at Rhyl and instead pressed on to Birkenhead depot where the 33-strong hybrid fleet that operates beneath the Mersey tunnels is based. Apparently, Arriva spends over £750,000 annually on tunnel tolls. Here we were met by Engineering Manager, Colin Hayes. Over a third of the Birkenhead fleet is hybrid, all being Volvo B5LH models with Wrightbus Gemini bodies. They are finished to a high specification including e-leather seats and wi-fi and are used on the various services traversing the tunnel including the 432, 437 and 487. They are ideal for this application, not just because they are popular routes, but also because the two ends of the tunnel are two of the three big pollution hotspots in the area. 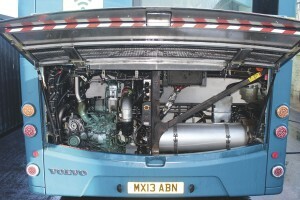 The hybrids started entering service in March 2013 carrying the two tone green livery scheme Arriva employs for ecological buses, including the Runcorn gas fleet. There were a couple of early issues. Volvo replaced an engine that was losing oil pressure in one and there was also a hybrid battery pack that inexplicably refused to hold its charge replaced under warranty. Since these early hiccups they have been extremely reliable achieving over 99.9% uptime. Phil Cummins explained that there are now no day to day running problems with them. They work 14-16 hours a day and they are also used on night services. ‘They are so fuel efficient,’ he said. They do 8.8mpg compared with around six mpg for diesels, he claimed. 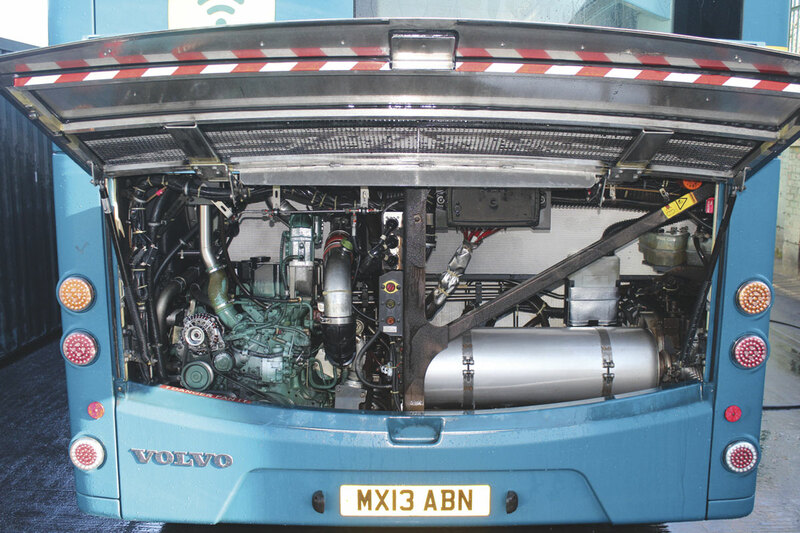 In what is a first for Arriva and Volvo in the UK, the hybrids are being maintained in-house helped by a parts-only contract with Volvo, supplied through Thomas Hardie. All fitters at Birkenhead went on an in-house training course to begin with. 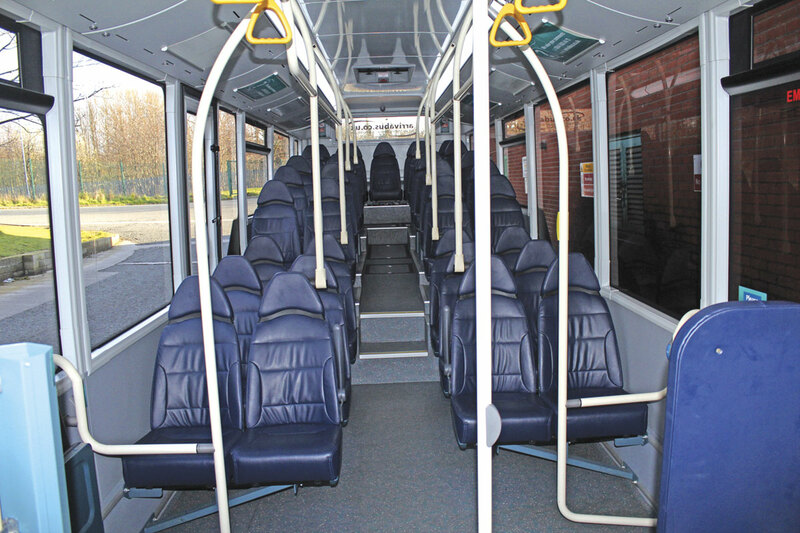 Following this up, six people have already attended IMI courses at which they are shown all aspects of the buses including how to undertake a full decommissioning of one. IMI courses are the industry standard for looking after 600 volt systems. A further one is being run this month. There has been the odd unexpected issue. One was operating in New Brighton when a freak wave hit it and damaged the Arris motors, taking out the power steering. The recharge put in to God was unsuccessful. 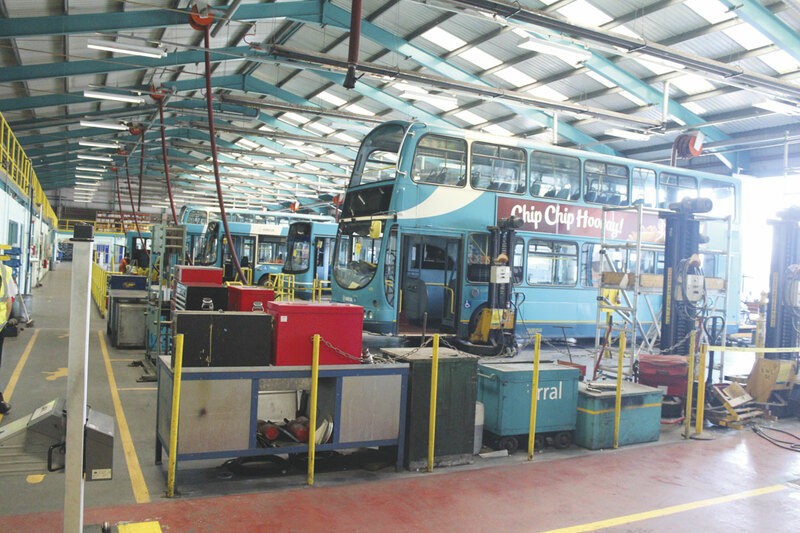 Originally a vast covered tram depot, Arriva spent £4.5m on remodelling the Birkenhead site some years ago and it now has a large open parking area and new workshop facilities with 11 pits, two flat bays and a VOSA ATF. Further investment will see two new Istobal bus washes installed at the end of the month, while the ATF facility will be developed to undertake Class IV and V MOT testing on cars and light commercials. As well as the Birkenhead fleet, 11 identical Volvo hybrids are also operated in Bolton on route 10. This is a good route and Arriva wanted to try them on it. Despite having 66% of the market, there is strong competition with Stagecoach on many routes. Nevertheless, where voluntary partnerships are in place the two accept each other’s tickets. ‘It’s good for passengers,’ said Phil. 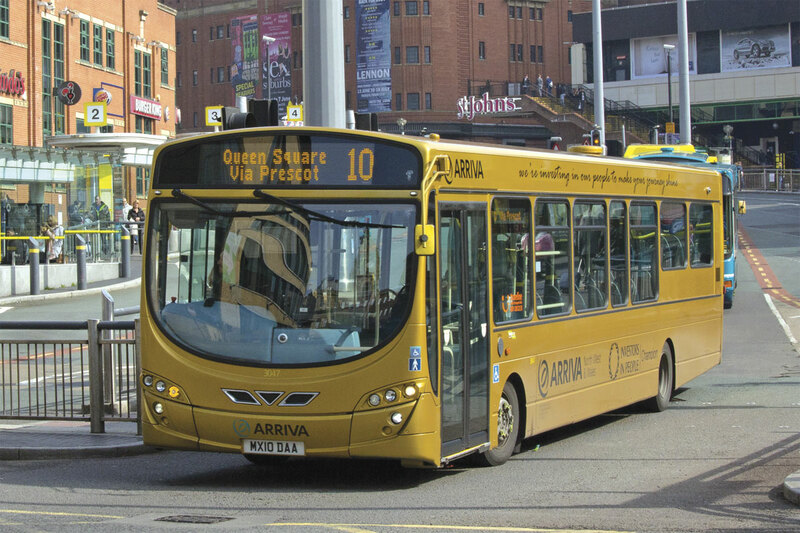 On 1 April Arriva will sign a Statutory Quality Partnership Agreement covering the Wirral and there are plans for another in Southport. Such agreements will only happen without Liverpool because of the bus lane issue. Currently Liverpool will not sign SQPs. 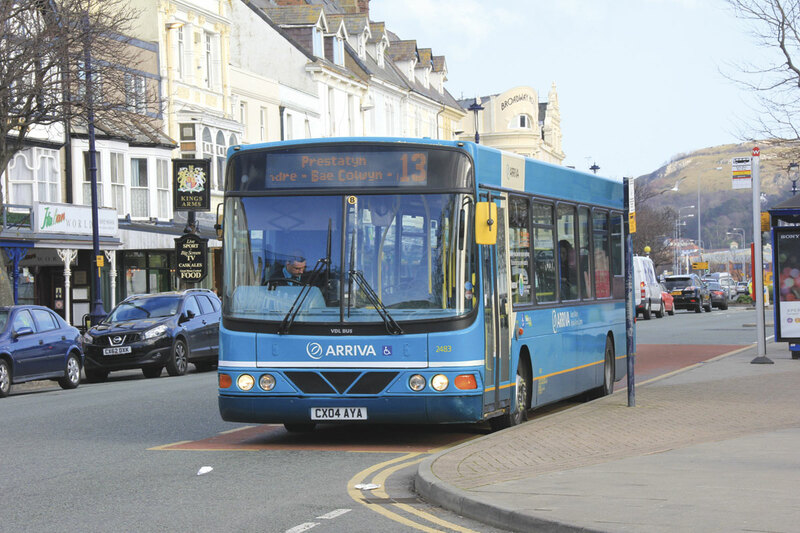 Part of Arriva’s growth strategy encourages companies to experiment on fares to see whether they can generate growth through fares promotions. Across Merseyside, the weekly ticket price was reduced from £19 to £15 last summer in a move that has generated patronage but not lost revenue, so it has effectively cost nothing. The benefit has come in passenger recognition as the latest Passenger Focus survey results show an 11% year on year improvement in the value for money score. On the hybrid operated 10 service in Bolton, a ‘Ten on the Ten’ promotion has just been launched offering a week’s travel on the 10 route for £10. For good measure it was launched on 10 March. Phil Stone commented, ‘if you get employee engagement and passenger satisfaction up and get your operation quality up, the revenue will look after itself.’ He believes strongly in the importance of employee engagement and notes that passenger surveys, employee surveys and profit are all very much linked. ‘People like to be with a company that is excelling. They want to do a good job and they want to be seen to do a good job,’ he said. His philosophy combines the need to continually improve both core and non core growth, to keep an ever watchful eye on internal efficiency and be a partner of choice for local authorities. A positive is that some Better Bus Area funding has been won for the Knowesely area that will be spent on bus priorities, traffic light priorities, cameras, realtime information and AVL.